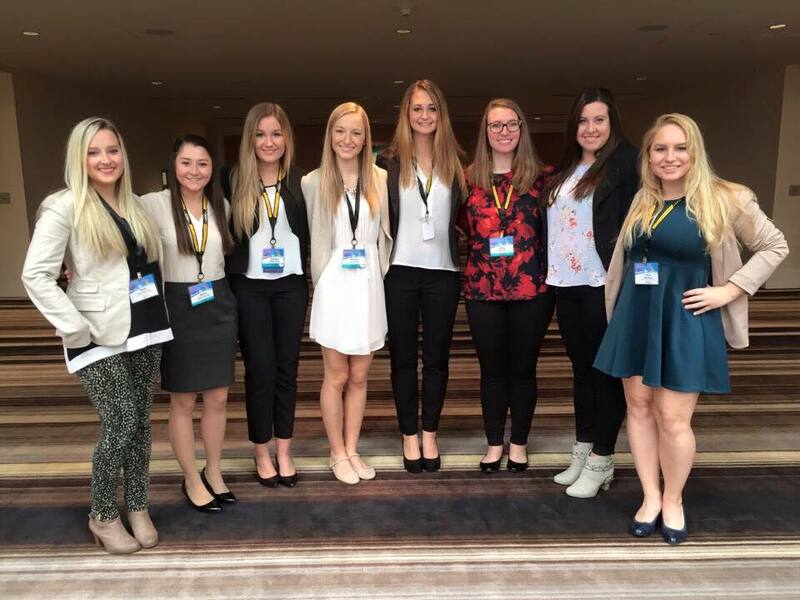 Last weekend, our eight executive board members were privileged to attend an array of impressive programs and listen to noteworthy speakers at the PRSSA 2015 National Conference in Atlanta. Starting and ending the weekend on high notes, two of my favorite parts were the first professional development session on successful event planning with Carly Nash and Daniel Dao from Ignition, Inc., and the career development exhibition where we networked with a roomful of agencies. I learned the ins and outs of experiential marketing with Carly and Daniel and saw their creativity in practice when they showed us case studies that brought entire cities together. They discussed the importance of establishing a consistent view of your brand, and how to gain support for it through engaging community events. At the career development exhibition, recruiters were exchanging contact information and tips for securing internships and full-time jobs. Even in Atlanta, we were able to connect with a Penn State alumna recruiting at one of the agency tables. Overall, it was an unforgettable weekend spent with an incredible executive board. One of the benefits of attending national conference was the opportunity to also attend PRSA sessions, which were part of the PRSA International Conference. PRSSA members were invited to attend a general session with speaker Daniel Lubetzky, founder and CEO of KIND Snacks. Lubetzky focused on learning to think with “and” instead of “or” when it comes to social entrepreneurship. Specifically, he discussed how his entrepreneurial journey and the experiences he encountered along the way helped to shape his current approach to business decisions. “The most successful people have many failures. I like to learn from failure because I find out what stretches me,” said Lubetzky. He started KIND in the hardest part of his life, and he experienced several failed business ventures. However, Lubetzky stressed that these failed experiences, in addition to the kindness of others, allowed the KIND brand to be as successful as it is today. He also covered the role of strategic communications for the brand, including various product-based approaches and social campaigns. For example, KIND is giving out #kindawesome cards to anyone who is spotted in an act of kindness. With this card, people are able to enter a code online to receive a free snack as well as a new card to pass on to someone else caught in an act of kindness. From start to finish, Lubetzky instilled a sense of hope into the minds of all the young entrepreneurs in the room. Whether it was a comical anecdote about a failed experience or a meaningful lesson learned, his story made it easy to walk out of the session feeling inspired. While each day of National Conference offered great speakers and a lot of information about the different world of PR, my favorite session was “PR in a Hyper-Connected, Internet of Things World.” The session was presented by Brian Easter, Co-Founder and CEO of Nebo, a PR agency based in Atlanta. I was expecting this session to re-hash most of what we learn in our PR classes now about how to utilize social media and how important an internet presence is for a company. What I didn’t expect was a great deal of insight about how to not get caught up in the flashiness and speed of the Internet and trying to get your client into the spotlight. Easter talked about how important it is to recognize the human-centered approach and the value of not being “desperate for attention.” He also talked about the value of inspiring others and always making sure to work on projects that have meaning to you. Things I learned during this hour stuck with me throughout the weekend, and are definitely lessons I will be keeping in my back pocket when I start my career. I’ve previously attended the PRSSA National Assembly in Charleston, South Carolina, so I was so thrilled to head back down south, this time to Atlanta, for the 2015 PRSSA National Conference! There were so many memorable sessions from this conference, including the favorite for Entertainment PR enthusiasts: Y’allywood: The Hollywood of the South. I especially enjoyed the Trending Now: Social Media Marketing presentation by Katie Greene of Edelman Digital and Devon Wijesinghe of Insightpool. Despite all of the incredible speakers and informative presentations, my favorite parts of the conference were the chances we were able to network with industry professionals and fellow PRSSA members from across the country (yes, even members from Hawaii were in attendance). I thoroughly enjoyed the career fair that was held on Monday, before we had to fly back to State College. Large companies such as Ketchum, Edelman and Golin were in attendance as well as smaller, local companies such as Nebo and The Reynolds Group. Along with networking at the career fair as a part of the conference, our chapter took a small side trip to CNN’s World Headquarters to get a backstage tour of their studios. 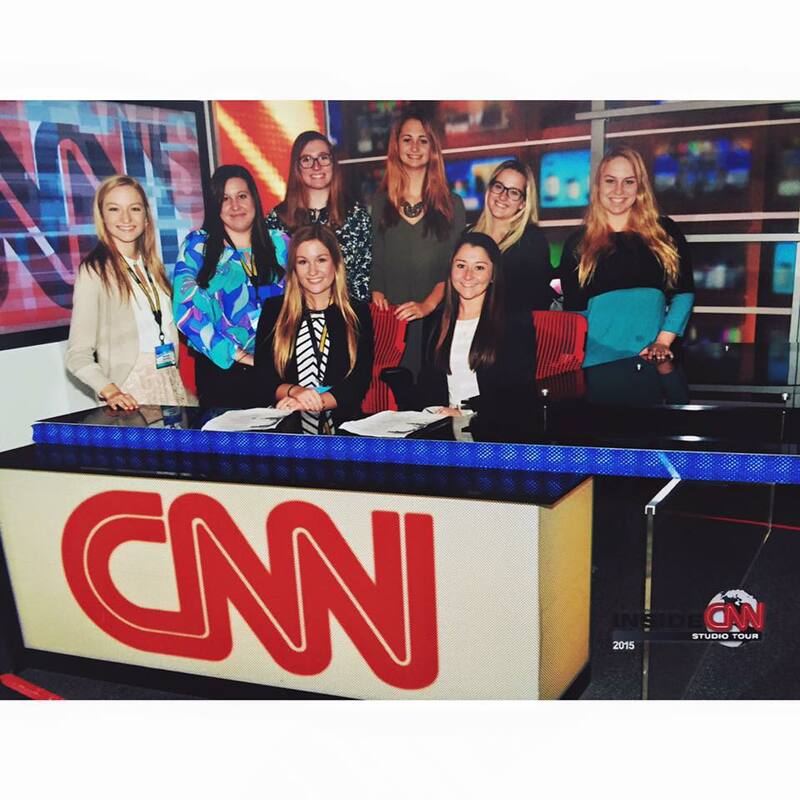 This was clearly a highlight of our trip being communications majors, and we found out we were one of many PRSSA chapters that made a visit to CNN over the course of the long weekend! All in all, Atlanta had so much to offer, and the conference was a great way to share and collaborate on ideas for developing our chapter and enhancing our career search for after graduation. I had a great experience at National Conference in Atlanta. We all learned so much from the various speakers and even from meeting the members of other PRSSA chapters from across the country. We attended many professional development sessions but my personal favorite session that I attended was with Scott Farrell of Golin. He spoke to us about the importance of global communications in today’s world. One of the best examples he gave of this importance was a time when Golin pitched a campaign idea to clients in various countries – an idea that made perfect sense in the context of American society, but that contained many aspects that were translated as offensive by other cultures. There was no way for the Golin team to predict this, but they had no choice but to be sensitive and learn from their mistake. They listened to the needs of the client and adjusted the campaign in seemingly minor, yet necessary ways so that it could be successful in its respective countries. He also gave several examples of times he had said or done something that was considered unacceptable in other cultures – he couldn’t have known unless he lived that experience. Having a global mindset is something I think my generation doesn’t focus on nearly enough and this is why I was so happy to hear it from Scott Farrell. Golin really strikes me as an agency that does not see ethnocentricity as an option – this is something I have a lot of respect for and Scott Farrell’s presentation only confirmed this. Overall, PRSSA National Conference was a great success and I feel so fortunate to have attended. I can’t begin to describe all the lessons I learned at National Conference, but one session I feel stood out to me the most was the officer discussion. This was a brief workshop they held Saturday night where executive board members of each chapter were given the chance to meet with members from other chapters who held the same position. Being able to interact with others and discuss how different schools operated was a great opportunity and allowed me to identify our own chapter’s strengths and weaknesses more easily. We all shared our goals and offered advice to one another for the areas we wanted to improve. It was nice to see such a motivated group of young individuals come together and build off of one another for a common cause. I will definitely be using the insight I gained moving forward to help make the Lawrence G. Foster chapter the very best it can be. One of the most interesting sessions I attended at the conference was a panel on sports PR. The workshop featured three women that were working in the sports industry, and they each spoke about their experiences in their respective sports. As someone who has always had a dream to work in the NHL, this was definitely a session I was looking forward to. Listening to each of the panelists speak about her experiences in the industry really made me question if I was cut out for the sports industry. I learned from the panel that it takes more than just, “being a fan since birth,” to make it in the sports industry. Your job comes before your fandom, always. While it is beyond amazing to spend your days at the game, it takes a lot of personal sacrifice to work in sports. Lots of long nights, early mornings, traveling, and in-game duties like taking and distributing statistics. Hearing the experiences of the women will make me question going forward whether I should mix my passion for sports with work. While the entire conference was jam-packed with incredibly insightful speakers, I was very much looking forward to the keynote session on Sunday morning, “Meet the Living Legends”. The panel consisted of Pat Ford from Burson-Marsteller and Ellen East from Time Warner Cable. Hearing the different insights they have gained from contrasting agency and corporate careers was quite inspiring. It was incredible to see the passion they held for public relations, especially after so many years in the profession, and to hear how they overcame hardships in their path. I loved spending the weekend with the executive board and am so thankful I was given the opportunity to attend my first National Conference. I left not only with career insights and a larger network, but also with a group of girls to call my good friends. ← The Starbucks Cup: PR Nightmare or Opportunity?